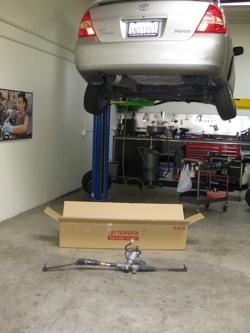 Classic Prius, model years 2001, 2002, and 2003, employ a 12V electric motor for power steering assist. The following is an explanation of how the system is designed, how it fails, and how much it costs to fix. The motor is integrated around the shaft of the pinion gear (input part of the steering rack) and the amount of assist is interpreted through a torque sensor, mounted at the top of the motor. 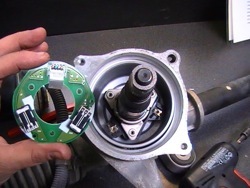 The sensor has two pads, each with two “fingers” (think of the needle on a record player); as the steering wheel is turned the sensor flexes, changing where the fingers touch the pads, which corresponds to varying voltage values sent to the steering computer. The amount of flex translates the resistance to steering and, therefore, the amount of assist needed. This sensor has a penchant for failure, triggering the “Problem” screen on the center display, illuminating “PS MAIN” for power steering (pic forthcoming), and setting trouble code C1513: Torque Sensor Abnormal/Malfunction. Out of range voltage values are saved in the computer’s “freeze frame” at the time of failure and confirm the code and that the sensor is bad. The component cannot be purchased separate from the rack. Other symptoms include jerky steering assist (sometimes quite frightening). It’s possible for the code to set with no change to steering performance. We have also experienced intermittent steering assist from cars with no codes or warning lights (but no less scary), which may originate from the torque sensor or internal failure of the assist motor windings. Regardless the rack must be replaced as a unit. Toyota did issue a recall campaign for steering racks on early models (first three months of the 2001 model year run, produced between May 9th, 2000 and July 21st, 2000, which equates to less than 2000 units), with replacement covered by Toyota for free. Of the cars we’ve seen with rack failures, none was produced during this small window (which makes you wonder what exactly they improved); in fact we’ve even seen a failure in a car that already had its rack replaced under this campaign (years ago). In short, while there is a chance your rack could qualify for free replacement, it’s not likely. We do however check to see if the campaign applies to any vehicle’s we diagnose with this condition. Given the widespread failure of these components, we no longer entertain used replacements. We did replace a rack with a used one once, at the owner’s insistence, and it ended up being bad “out of the box” and proved a real PITA for everyone involved. The good news is that new racks are readily available from dealer parts departments and can be replaced quickly and easily. 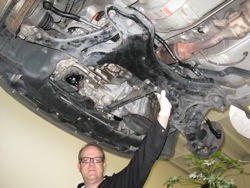 The unit is mounted to the top of the vehicle subframe (on John’s hand, in pic); there are a few tricks to stay out of trouble (a cautionary note to other techs who may be reading), but LG charges 2.5 hours for R&R plus a front wheel alignment.